No one likes being sick. No one. I don't like cold and flu season as is seems like someone is always sick in my house. This week it is me who has a cold. As I am writing this post my nose is dripping. I, for the most part, eat healthy, exercise, get plenty of sleep, and wash my hands often so how I sick, puzzles me. I am the last one to get sick. I think I picked up this cold when I went on a field trip with my kids.Being around a bunch of kids will get one sick. When I get sick I always make a cup of hot tea and take extra vitamin C. The one thing I don't like to do is reach for medicines as I want any chemicals in my body. So what can a person who tries to lead a natural clean life do when they get sick? They can reach for natural remedies made from herbs. There are many herbs that help our bodies when we are sick. I discovered Sprouts Cold Remedy. I was sent a bottle to review, funny how the day it comes in the mail I have sniffles. This natural remedy is a blend of herbs that help the body get over a cold faster. It has Echinacea and Elderberry fruit, two items that I am familiar with that are great for colds, and Red Root, Green Tea Leaf, Thyme, Red Clover, and Myrrh Gum in it. This blend contains properties that help the body resist and kill germs, thus preventing them from attacking. I have already used Sprouts Voice Remedy and have found it works wonders in making my throat feel better. So I was eager to try Sprouts Cold Remedy. I was happy that I only had to take one dropper of the remedy, every four hours. I found the medicine to have a pleasant taste, which is good as taste is important for me. When the Sprouts Cold Remedy arrived, I felt a cold coming on. I had the sniffles and my nose was drippy. So I ingested the herbal supplement right away and then every 4 hours. The next day I still had a drippy nose but felt fine. I continued to take the supplement every 4 hours and my nose seemed to drip less. The runny nose continued for one more day, but it needed less blowing and I continued to take my drops. The next day my drippy nose stopped. I never developed any other symptoms beyond the drippy nose. The ironic thing is my husband kissed me the day I had a drippy nose and three days later he had a sore throat and bad cough. If he had only started taking Sprouts Cold Remedy when he felt the cold coming on. 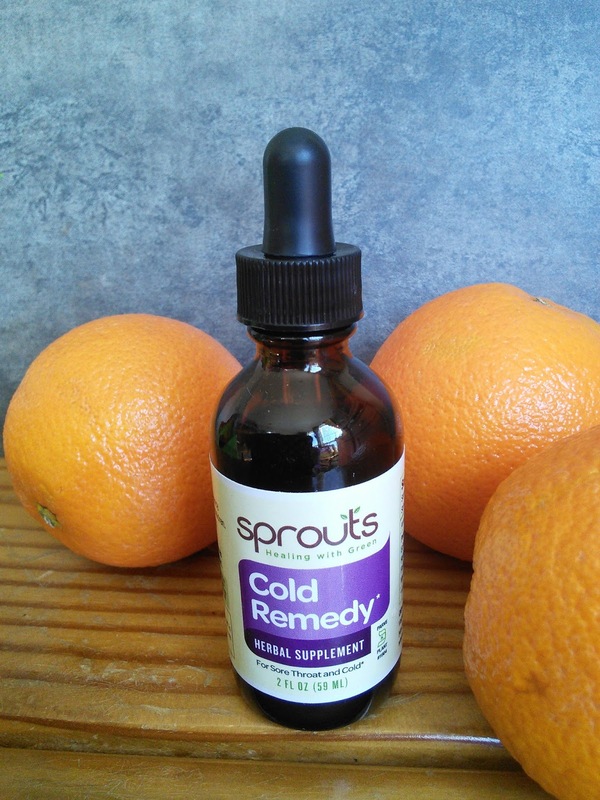 So how does Sprouts Cold Remedy work? These herbs help boost the immune system to keep the germs from multiplying. They also help the body expel mucus from the respiratory system, I wonder if that is where the germs hide. The company made this formula based on information from famous herbalists who have research to back their knowledge and observations. The company also tested the ingredients before making the final formula. 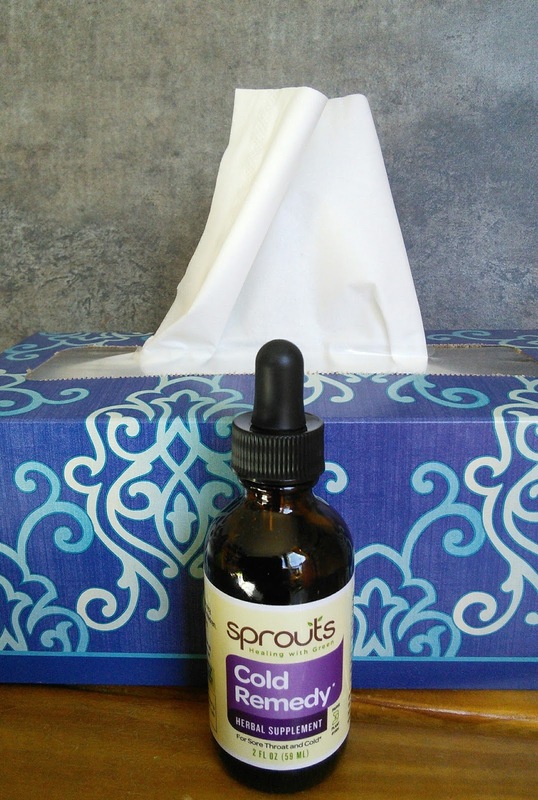 You can also take Sprouts Cold Remedy when you feel a cold coming on and it will help your body fight the germs. 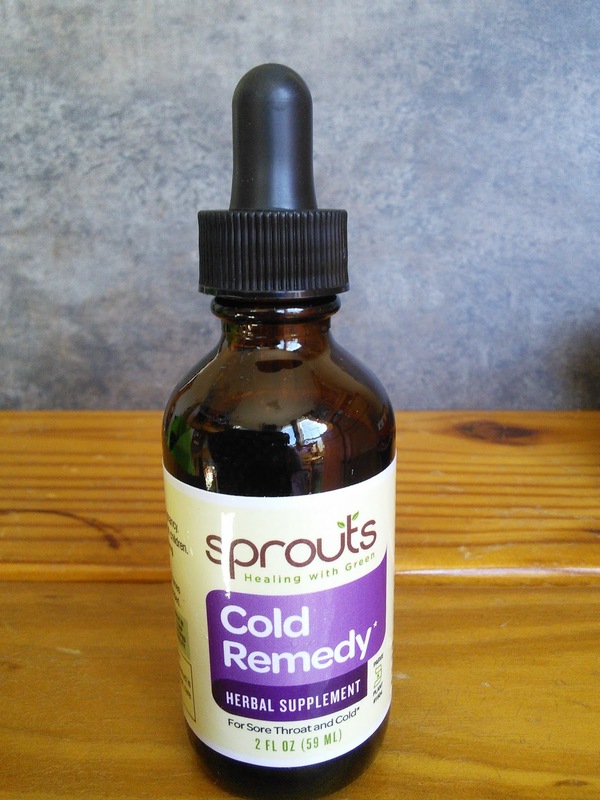 What are the ingredients in Sprouts Cold Remedy? Echinacea – an immune system stimulant, it muscles up the body’s natural defenses, fights inflammation, and kills bacterial and viral infections. It is good for the immune and lymphatic systems as well as useful for colds, flu and respiratory infections. Red Root helps supports the lymphatic system, improves circulation, and has antibacterial and antiviral properties. It is extremely useful in relieving sore throats. Green Tea is known as a powerful immune booster and antioxidant. Elderberry prevents the virus from attacking cells and promotes perspiration and the elimination of toxins through the skin. It is effective against colds and flu viruses and is recommended as a treatment for upper respiratory infections. Thyme helps rid the nasal passage of mucus, inhibits the growth of bacteria, kills germs, breaks up congestion, helps to loosen and expel mucus from the lungs and head, and stops the coughing associated with a cold. Myrrh Gum promotes healing of sores, shrinks inflamed tissue and helps fight bacteria in the mouth. It has been used to treat colds, coughs, bronchitis and a sore throat. 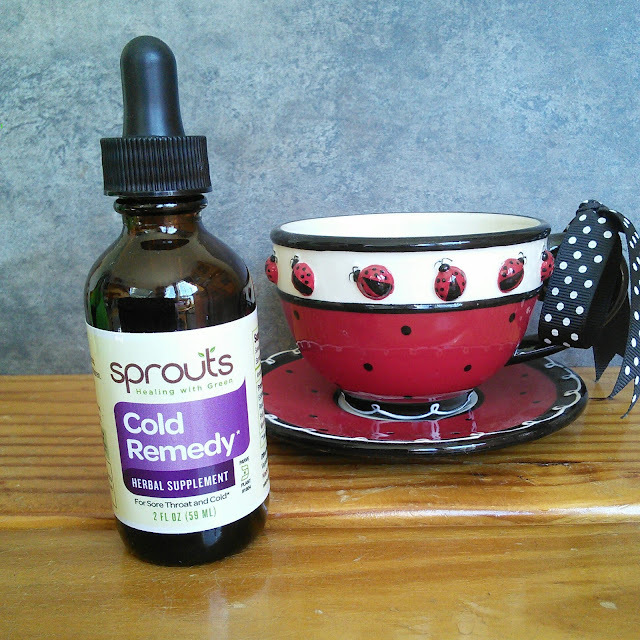 If you want a natural way to treat a cold and shorten its duration, then Sprouts Cold Remedy might just be for you. Here is some additional info that I found on their website to help you understand how this natural remedy works. Boosts natural immunities, preventing users from getting sick in the first place. You can purchase Sprouts Cold Remedy at Amazon or on their website. This bottle also has 59 servings in it. "These opinions are my own and I received a bottle of Sprouts Cold Remedy to facilitate this review." Sounds interesting. I would definitley give it a shot! Yes, natural remedies are so good and work just as well. Need to check this one out! I always endeavour to use Natural remedies as in real fresh from the farm ingredients yet this sprout drops sound amazing. I wonder whether they are in UK. I totally use mind over matter with colds and flus mostly but I may make an exception here. Thanks for sharing! It's good to know that it has all natural ingredients. It seems pretty effective too, that's great! I would love to try this. I have a cold right now, and my prescription meds limit me on what I can take to help. This would be great! I'm all about fighting illnesses the natural way...at least to a point. I'll have to check it out the next time I get a cold. I love using natural remedies! Thanks for sharing such a helpful post! I have been quite lucky this year in comparison to last year as I had the worst cold and flu and it went on for months. But this year it has been less cold. I like using natural products. This sounds like a great remedy for colds. I like using natural remedies. This post is really helpful. I love using herbal supplements and this one sounds great to fight the common cold. I can attest to the ginger. My daughter gets frequent upset stomachs and ginger works like a charm for her. I always prefer using natural remedies. Thanks for this! I prefer more natural alternatives to fend off cold and flu season. I'll have to try Sprouts Cold Remedy! Herbal remedies tend work more in our family, but I am always game to try other ways if they help. Glad to know this product worked. Its something I need when my son has the sniffles. I hate how it disrupts his sleep. Love hearing about o it natural ways to fight colds! This would come in handy right now. I have been sick for weeks. Finally feeling better. I will be seeking this out to keep in the ready.